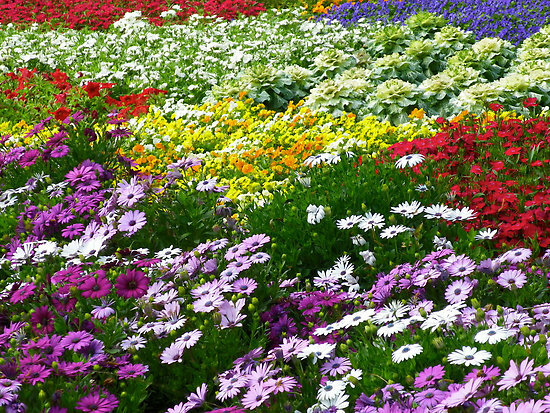 This garden has every color of the rainbow. All the flowers must have full sun in order to grow and bloom. The best place to have this garden would be in a long border or along the driveway. This is an annual garden blooming all summer and going to seed in late fall. If you let the flowers go to seed, you can collect the seeds in a paper bag, save them, and plant again next year. Butterflies and bees also like herbs, and so do the birds. You could plant these herbs as part of your flower garden. These herbs smell nice and produce blooms and nectar. One or two plants of each will be enough for the bees, birds and butterflies to find them. Lavender, pineapple sage, spearmint, lemon balm, dill, scented jasmine, parsley, fennel. Plant the herbs in full sun in the garden or flowerbed. You could also plant them in containers and group them together. The birds, bees and butterflies will flock to them. A shallow container filled with fresh water would be very welcome in the Rainbow Garden. During dry and hot days, it’s difficult to find fresh water. A three inch deep stainless steel bowl placed near the garden and filled with fresh water each day, would help our little winged friends as they search for food. Keep the bowl clean and filled with fresh water, and watch the butterflies come to visit. You can grow all of these flowers and herbs in window boxes, planters, pots, containers and hanging baskets. Be sure to keep the soil moist and snip off the dead leaves and flowers. The Great Spirit placed a rainbow in the sky for all on Earth to see, a symbol of the love she has for you and me.